There are several colorful (and one "manly") coaster in various locations around the house, used on a daily basis. Partly because they are cheerful and fun (except the "manly" coaster, that's just practical, ahem), and mostly because I'm clumsy and these coasters are also great for wiping up little spills. These are also a nice way to use up odd bits of yarn. 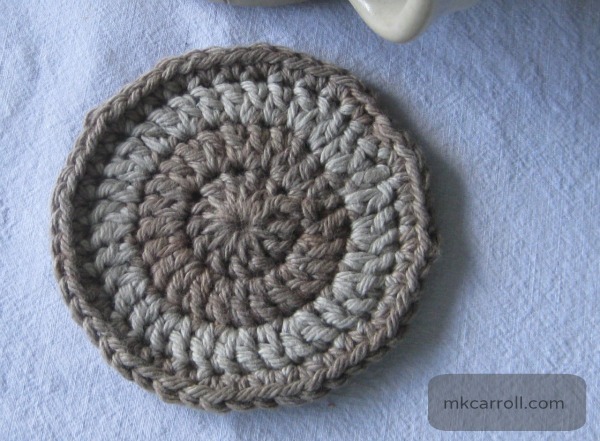 For this "manly" coaster I used the small skeins of kitchen cotton I had been using in dye experiments. The darker grey is dried kukui (Aleurites moluccana) leaf with iron mordant, and the lighter grey is fresh mint leaf with iron mordant.